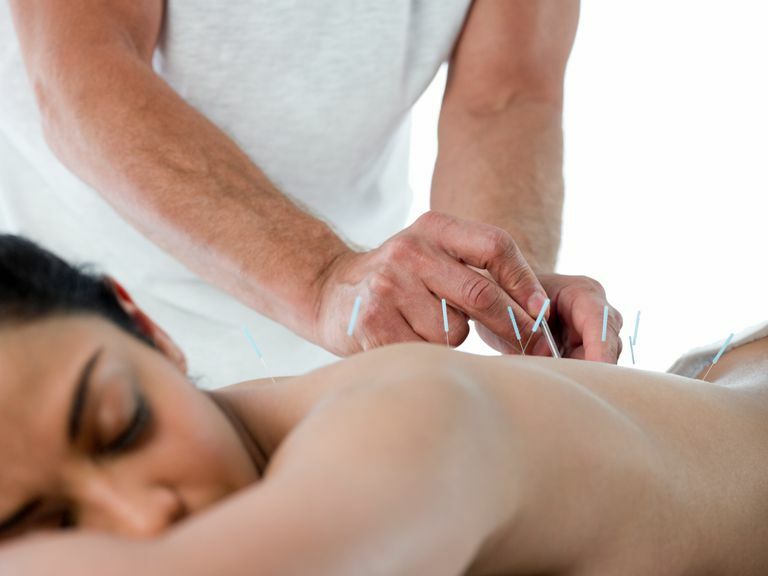 Long practiced in traditional Chinese medicine, acupuncture is an alternative therapy that involves using needles to stimulate specific points on the body. These points are said to connect with certain pathways (or "meridians") that carry vital energy (or "chi") throughout the body. According to the theory of acupuncture, blockages in the flow of chi disrupt well-being and lead to illness. By stimulating acupuncture points, practitioners aim to clear up blockages and restore the client's health and vitality. Pain or musculoskeletal complaints account for seven of the top ten conditions for which individuals use acupuncture, according to the 2007 National Health Interview Survey. The National Center for Complementary and Alternative Medicine states that acupuncture appears to be a promising alternative for some pain conditions, but cautions that further research is needed before conclusions about acupuncture's effectiveness can be drawn. A research review published in 2009 suggests that acupuncture is at least as effective as, or possibly more effective than, medication in protecting against migraines, while another review from the same year shows that acupuncture may be beneficial for people with frequent episodic or chronic tension headaches. Research indicates that acupuncture may be useful for people with osteoarthritis (especially osteoarthritis of the knee). In a 2007 review and meta-analysis, for instance, researchers concluded that acupuncture administered in an intensive two- to four-week treatment regimen may offer significant short-term relief of osteoarthritis-related knee pain. In a 2009 study of 638 adults with chronic low back pain, participants undergoing 10 acupuncture sessions (administered over the course of seven weeks) had greater improvement in symptoms than those who received standard care. One year after treatment, study members in the acupuncture group were also more likely to show significant improvements in dysfunction. A meta-analysis of 33 clinical trials, published in 2005, concluded that acupuncture effectively relieves chronic low back pain. However, the review's authors note that "no evidence suggests that acupuncture is more effective than other active therapies." Acupuncture is generally considered safe, and adverse events are rare. Additionally, the National Center for Complementary and Alternative Medicine notes that "there are fewer adverse effects associated with acupuncture than with many standard drug treatments (such as anti-inflammatory medication and steroid injections) used to manage painful musculoskeletal conditions." Due to the limited research, it's too soon to recommend acupuncture as a standard treatment for pain relief. It's also important to note that self-treating a condition and avoiding or delaying standard care may have serious consequences. If you're considering using acupuncture, make sure to consult your physician first. Bjordal JM, Johnson MI, Lopes-Martins RA, Bogen B, Chow R, Ljunggren AE. "Short-term efficacy of physical interventions in osteoarthritic knee pain. A systematic review and meta-analysis of randomised placebo-controlled trials." BMC Musculoskelet Disord. 2007 22;8:51. Cherkin DC, Sherman KJ, Avins AL, Erro JH, Ichikawa L, Barlow WE, Delaney K, Hawkes R, Hamilton L, Pressman A, Khalsa PS, Deyo RA. "A randomized trial comparing acupuncture, simulated acupuncture, and usual care for chronic low back pain." Arch Intern Med. 2009 11;169(9):858-66. Ernst E, White AR. "Acupuncture as a treatment for temporomandibular joint dysfunction: a systematic review of randomized trials." Arch Otolaryngol Head Neck Surg. 1999 125(3):269-72. Linde K, Allais G, Brinkhaus B, Manheimer E, Vickers A, White AR." Acupuncture for migraine prophylaxis." Cochrane Database Syst Rev. 2009 21;(1):CD001218. Linde K, Allais G, Brinkhaus B, Manheimer E, Vickers A, White AR. "Acupuncture for tension-type headache." Cochrane Database Syst Rev. 2009 21;(1):CD007587. Manheimer E, White A, Berman B, Forys K, Ernst E. "Meta-analysis: acupuncture for low back pain." Ann Intern Med. 2005 19;142(8):651-63. Muller M, Tsui D, Schnurr R, Biddulph-Deisroth L, Hard J, MacDermid JC. "Effectiveness of hand therapy interventions in primary management of carpal tunnel syndrome: a systematic review." J Hand Ther. 2004 17(2):210-28. National Center for Complementary and Alternative Medicine. "Acupuncture for Pain." NCCAM Publication No. D435â€¨Created May 2009. Trinh KV, Phillips SD, Ho E, Damsma K. "Acupuncture for the alleviation of lateral epicondyle pain: a systematic review." Rheumatology (Oxford). 2004 43(9):1085-90. Witt CM, Reinhold T, Brinkhaus B, Roll S, Jena S, Willich SN. "Acupuncture in patients with dysmenorrhea: a randomized study on clinical effectiveness and cost-effectiveness in usual care." Am J Obstet Gynecol. 2008 198(2):166.e1-8.